Researchers recently added to their knowledge of land snails of Sabah (Malaysia, Borneo) including the discovery of 48 new species of land snails. Jaap J. Vermeulen, Thor-Seng Liew and Menno Schilthuizen reported on their findings in a full abstract here. Land snails were collected in large quantities from a variety of areas including quarries, river beds and on the side of the road. The land snails were then examined and viewed under a stereo microscope. The drawings of the land snails below were created using a stereo microscope along with a camera lucida device to aid in drawing. When naming the new snails, in the enumerations of localities, words were used from the Malay language: batu (= rock), bukit (= hill), gua (= cave), gunung (= mountain), pulau (= island), and sungai (= river). 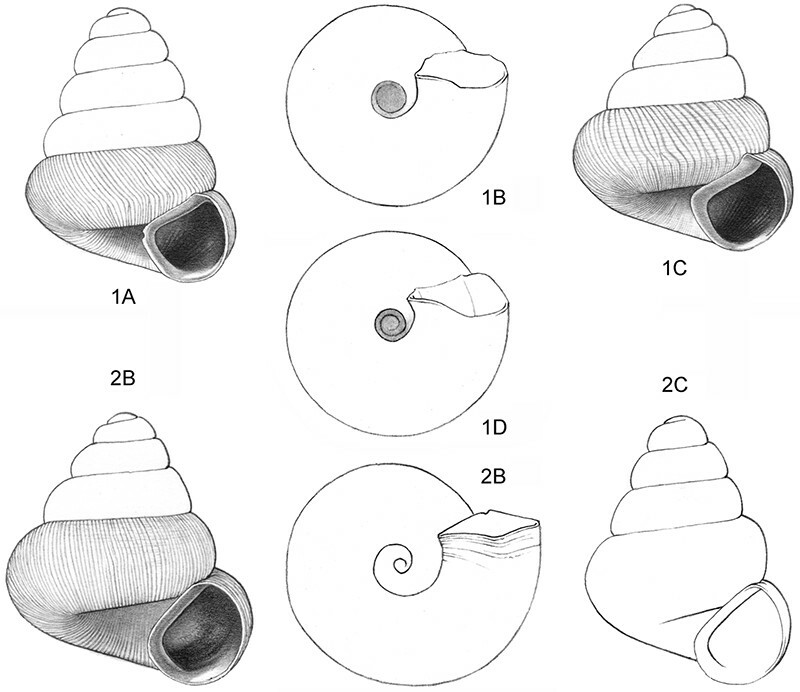 The land snails labeled 1 are Acmella cyrtoglyphe sp. 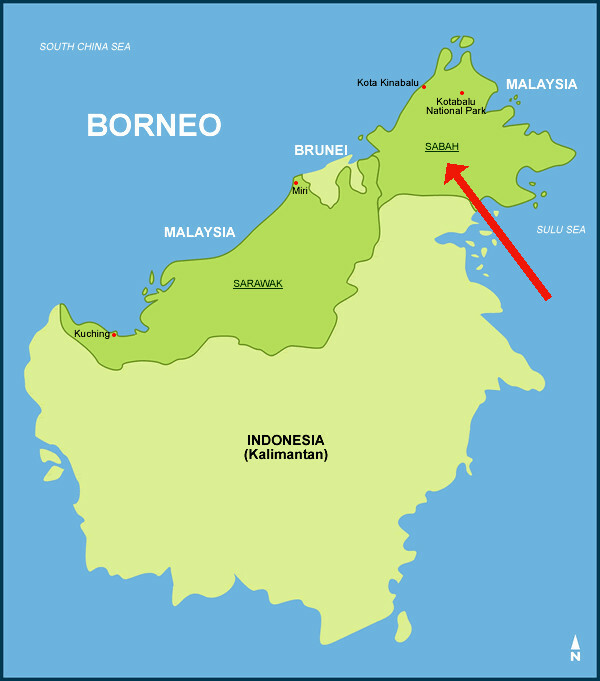 1A & 1B were found in the Sepulut Valley in the Interior Province of Sabah, Malaysia. 1C was found in Kinabatangan Valley in the Sandakan Provice. The land snails labeled 2 are Acmella umbilicata sp. and were found in the Pinangah Valley in the Interior Provice of Sabah, Malaysia. Land snail 1A is 1.4mm high and when viewing this land snail with a stereo microscope at 50x magnification, the land snail would fill about 30% of the field of view. Land snail 2A is 1.3mm high and when viewing this land snail with a stereo microscope at 50x magnification, the land snail would fill about 28% of the field of view. The land snails labeled 9 are Ditropopsis davisoni sp. and were found in the Matang River South of Long Pasia in the Upper Padas in Sabah, Malaysia. The land snails labeled 10 are Ditropopsis trachychilus sp. and were found on Kota Kinabalu-Tambunan road in Crocker Range N.P. in Sabah, Malaysia. The land snails labeled 11 are Ditropopsis koperbergi and were found in the Danum Valley Conservation Area, Sabah, Malaysia. Land snail 10A is 2.3mm high and when viewing this land snail with a stereo microscope at 50x magnification, the land snail would fill about 50% of the field of view. 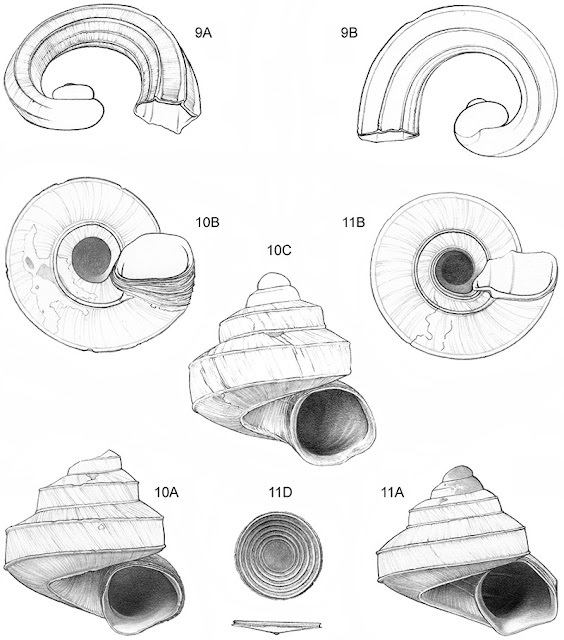 The land snails labeled 3 are Acmella polita and were found in the north end of the limestone ridge on the East bank of the Tabin River in the Segama Valley, Sandakan Province, Sabah, Malaysia. The land snails labeled 4 are Acmella ovoidea sp. and were found in the Pinangah Valley in the Interior Province of Sabah, Malaysia. 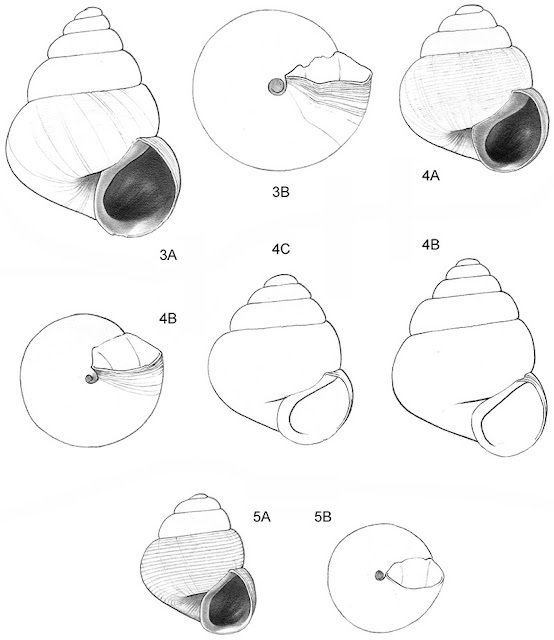 The land snails labeled 5 are some of the smallest land snails discovered: Acmella nana sp. and were found in the Niah Caves on the west side of the quarry in Sarawak, Malaysia. Land snail 5A is 0.7mm high and when viewing this land snail with a stereo microscope at 50x magnification, the land snail would only fill about 15% of the field of view.